More than half of bargain-hunting Londoners are likely to boast about their discounts, according to a survey. And as many as one in three would require 50% off before considering it something of a bargain, the study into British shopping habits found. However when it comes to haggling, Londoners are among the least confident in the UK with 40% never having tried to lower the price of an item. 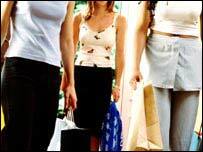 It also found a third of women admit to fibbing about the price of purchases. Men, meanwhile, are fractionally less likely to lie (26%) about their acquisitions, for example the cost of a car, plasma screen or stereo system. It also showed an emerging trend that Britons are prouder to appear savvy than flash, with only 2% lying to make people think they spent more than they did. Gary Goodman, from PriceRunner which conducted the survey, said: "This rise in popularity of shops such as Primark means that Londoners are more focused than ever on securing the best deal and are proud of it."